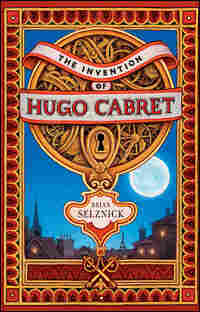 The Intricate, Cinematic World of 'Hugo Cabret' In The Invention of Hugo Cabret, author and illustrator Brian Selznick uses a striking combination of text and drawings to tell the story of Hugo, an orphan in Paris, and a reclusive genius from the early days of silent film. THE NEXT MORNING HUGO OPENED the toy booth and set it up exactly the way the old man always did. His fingers were still hurting badly, but he smiled as the customers straggled by and he collected the money. Still, there were long stretches of quiet. Hugo was frustrated at not being able to draw or play with any of the mechanical parts. He tried to teach himself to write with his left hand, but it didn't work. He looked closely at the windup toys. He tried to imagine what the old man was thinking as he built these toys. He must have hated being stuck here all day long. Maybe he was only happy for the time he devoted to building each new toy. Maybe they reminded him of building the automaton. When Isabelle came by after school, she joined Hugo on a stool behind the counter. Eventually, with no customers and nothing else to say, Isabelle tended to the loose ends of Hugo's bandages and took out a book. She began reading. Hugo recognized the book. It was the collection of Greek myths she had borrowed from Monsieur Labisse. "You've been reading that for a long time," said Hugo. "Oh, I've read it twenty times. I bring it back to the bookshop, read other books, and then take it again. I like the stories." Isabelle read the stories to Hugo, and he remembered hearing some of the myths when he was in school. She read about Mount Olympus and creatures like the chimera and the phoenix, and then read the story of Prometheus. Hugo learned that Prometheus had created humankind out of mud, and then stolen fire from the gods as a gift for the people he had made, so they could survive. So Prometheus was a thief. In his mind, Hugo suddenly saw the painting in the Film Academy library. One of the figure's hands was reaching up, holding a ball of fire, as if it were stealing the flames from above, and the other hand projected light, like it was a film. Hugo thought that maybe the painting was a version of Prometheus, except Prometheus was stealing fire from the gods to create the movies. Isabelle continued reading the story. It turned out that Prometheus was punished for his theft by being chained forever to a rock where an eagle came to eat his liver, which grew back every day. Prometheus had stolen the fire because he wanted to help the people he had created, yet he was still punished. Hugo had become a thief to survive and to help the automaton. What would his punishment be? Was he now going to spend the rest of his life behind the counter of this toy booth like the old man? Was this all he had to look forward to? Hugo tried to push that idea out of his head. There had to be something else. He found his attention being drawn to the clock across the hall. The big bronze hands moved slowly across the clock's face, like the sun across the sky. He wondered when it was going to stop running. Hugo looked at his injured fingers and wished he would be able to use them again soon. He opened the drawer and pulled out the blue mechanical mouse, which he unwrapped carefully. "It's the toy I was stealing when your godfather caught me. I broke it, and he made me fix it. I don't know why he kept it." "He must like you," Isabelle said. "In his dresser at home he has all the drawings I made him when I was little." Hugo smiled, and then Isabelle wound up the mouse. They watched it skitter across the counter. Hugo thought about his father's description of the automaton. "Did you ever notice that all machines are made for some reason?" he asked Isabelle. "They are built to make you laugh, like the mouse here, or to tell the time, like clocks, or to fill you with wonder, like the automaton. Maybe that's why a broken machine always makes me a little sad, because it isn't able to do what it was meant to do." Isabelle picked up the mouse, wound it again, and set it down. "Maybe it's the same with people," Hugo continued. "If you lose your purpose... it's like you're broken." "Maybe . . . maybe we can fix him." "I don't know, but maybe Rene Tabard can help us when he visits next week. He'll know what to do...."
Hugo and Isabelle were quiet for a moment, and then Isabelle said, "So is that your purpose? Fixing things?" Hugo thought about it. "I don't know," he said. "Maybe." "Then what's my purpose?" wondered Isabelle. "I don't know," said Hugo. The two of them stared at the clock, and then they put away all the toys, including the little mouse, and closed the booth. They collected the money they had made, and Isabelle put it in her pocket. "Before you go home, come with me," Hugo said, and he helped Isabelle through the nearest air vent into the walls. 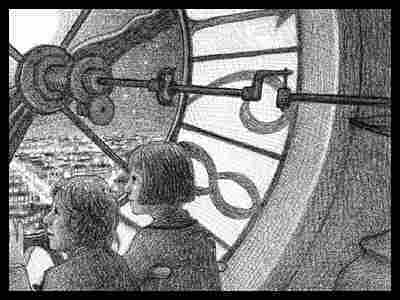 Between Hugo's injured hand and Isabelle's sprained foot, it was extremely difficult for them to get up the staircases and the ladder, but they helped each other and at last they came to the glass clocks that overlooked the city. The clocks were supposed to be lit from the inside, but the wiring had long ago stopped working. 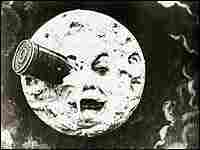 They watched the stars, and they saw the moon hanging high above them. The city sparkled below, and the only sound was the steady rhythmic pulse of the clock's machinery. Hugo remembered another movie he and his father had seen a few years earlier, where time stops in all of Paris, and everyone is frozen in their tracks. But the night watchman of the Eiffel Tower, and some passengers who land in an airplane, are mysteriously able to move around the silent city. What would that be like? Even if all the clocks in the station break down, thought Hugo, time won't stop. Not even if you really want it to. 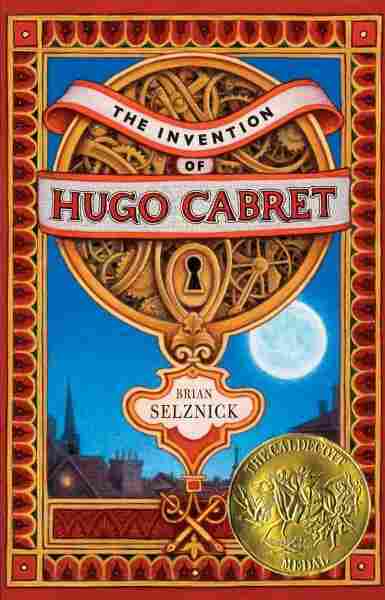 From The Invention of Hugo Cabret by Brian Selznick. Scholastic Inc./Scholastic Press. Copyright (c) 2007 by Brian Selznick. Reprinted by permission. Illustrations from The Invention of Hugo Cabret. 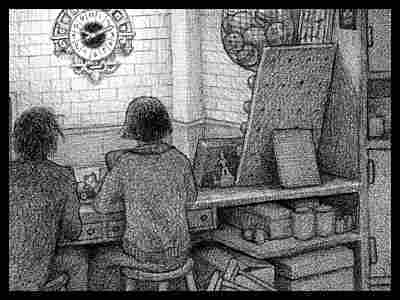 Copyright 2007 by Brian Selznick. Use with permission from Scholastic Press.